I was given this product to review in exchange for my honest opinion. 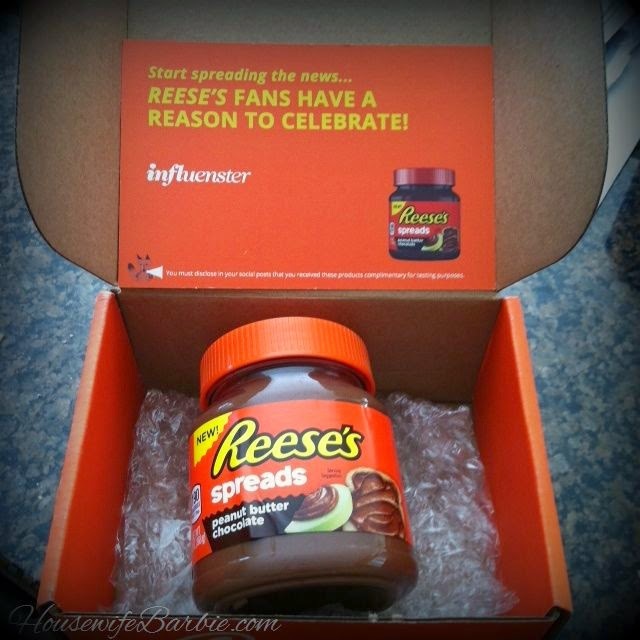 Thanks Reese's and Influenster! While I'm always excited to try new-to-me products on the market, this time around there was a family member whose excitement was over the top. My teenage daughter squealed when she saw this Reese's Peanut Butter and Chocolate spread on the counter. Literally squealed. And then she grabbed and spoon from the drawer, looked at me excitedly and asked if she could open it and taste it. She exclaimed it tasted "just like a Reese's Peanut Butter Cup in a jar!" While she would be content to eat the whole thing with a spoon, I was hoping for a little more creativity. After a little bit of brainstorming we had some great ideas. In the end, we decided it would be great in one of our family's favorite homemade candies; truffles. Since I'm not a huge fan of chocolate, I had to count on my family members for their feedback; Reese's spreads got 5 out of 5 stars from our family. Truly tasting like a 'peanut butter cup in a jar' it was finished off by our daughter over holiday break from school and she has informed me I can send her more jars in 'care packages' to college. Combine evaporated milk and sugar in small saucepan. Cook over medium heat until mixture comes to a full boil. Boil 3 minutes, stirring constantly. Remove from heat. Stir in chips and extract, stirring gently until smooth. 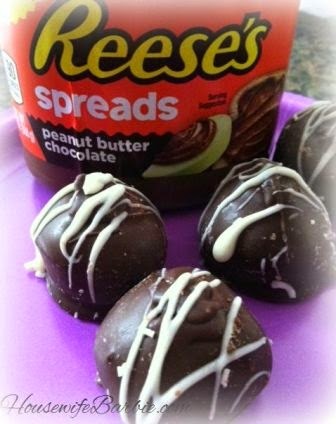 Stir in the Reese's spread. Chill mixture about 45 minutes until it can easily be shaped into balls. Use a spoon or a melon baller form truffles and dip them into melted almond bark, additional chocolate chips or candy coating. We always dip our truffles in dark chocolate or almond bark and melt additional white almond bark or white chocolate to drizzle on top.